If you love partaking in arts and crafts, DIY or other creative projects, then take advantage of our free fabric remnants. To get your hands on a free mixed bag of fabric offcuts is so easy up to 1.5 kg in weight; you can either pick them up from our London Bags of Love HQ for free or pay to have the bag delivered. Think of the possibilities you can make with these fabric scraps; patchwork quilts, handmade jewellery, bags, patch clothing and so much more. What's more, each bag contains anything from 110 different kinds of textile and are mostly white. From silk to neoprene, who knows what yours could contain. Free Remnants - Mixed Content - Mostly White - Neoprene is black only. Crafting, DIY, and sewing are such popular hobbies, so much so that some people craft for a living. Finding the right materials to accommodate all your craft projects can be very expensive. At Bags of Love, we want to help our customers fulfil their crafting passion while ensuring our eco-friendly practices are upheld. This is where our fabric remnants come in. This is my second delivery of fabric from them and I was not disappointed. Lovely quality and a good variety. I think this is a great idea to recycle scrap fabric! The fabric sent was good quality and arrived in 2 days and you get a lot of fabric for the price. What's not to love . . . I was so pleased with everything about this fabric. I loved that it was recycled instead of going to waste and I love that I have a good stash of fabrics I can dye for my art project. I ordered it one day and it arrived 2 days later! Consider me in love with Bags of Love! I got such good fabric. I had lots of blanket fabric which I can use to pad my art quilts and lots of other random fabrics mainly in white or off white. I will definitely order again and would like to thank Bags of Love for their generosity. We stock 110 different customised fabrics, each with their own attributes and qualities. From natural textiles such as silk, linen and cotton, to technical fabrics such as neoprene, our extensive selection of custom printed fabric has something for everyone. As you can imagine, with so many fabric orders coming in, there are bound to be a lot of offcuts. One of our main priorities at Bags of Love is to be as sustainable as possible and to reduce our impact on the environment by reducing our waste. This includes re-homing our beloved textiles wherever we can. Offering fabric offcuts to our customers is one such way that we can do this (and you can help). When a fabric is cut to size for a customer, there will be some fabric scraps left over. Instead of throwing these away, we are now offering them in 1.5kg bags for free. Please note that these are limited to a maximum of 1x bag per order (this is due to delivery costs). If you would like more than two bags, feel free to place another order for extra bags. If you order more than 1x bag in a single order, we will contact you regarding an extra delivery charge. We charge you the amount that the carrier charges us or delivery - we do not make a profit on this; it's part of our mission to become fabric waste neutral. What Textiles Will I Get In My Bag? The fun of these bags of fabric remnants is that you don't know what you are going to get. Our 110 fabric selection features so many different kinds of textiles. Fleece and cotton are available, along with chiffon and chenille, and pretty much everything in between. From organic textiles to waterproof, you can be sure of an interesting and exciting selection of polys, cotton and silk. The majority of your free offcuts will be mostly white or cream, but these remnants may have the odd splash of colour or print which may include text or barcodes. With a 1.5 kg bag, you will have enough scraps to create a whole host of craft projects. These remnants will vary in size, you may receive some large pieces and some small pieces, as they are all packed at random. The coloured fabrics consist of mainly fleece fabric, often in blue, pink, cream and black - perfect for creating scarves gloves and blankets in the cold, winter months. This is not exclusively the case, and you may find other colours or materials in your mixed bag - it's like a lucky dip. Natural fabric remnants tend to be long and thin. How Can I Get A Bag Of Fabric Remnants for Free? 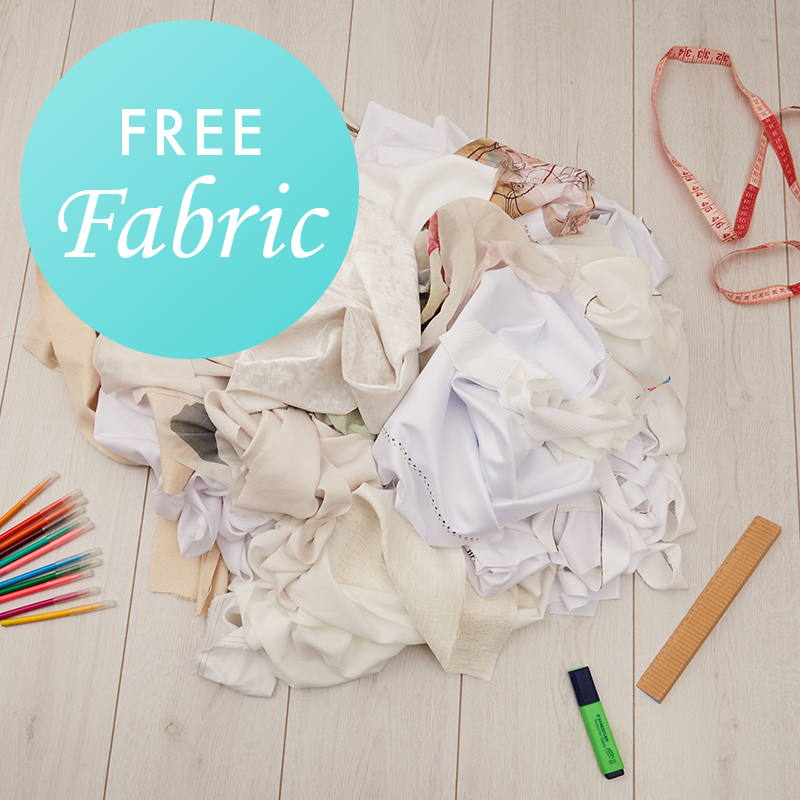 To claim your free bag of fabric scraps couldn't be more simple. Max one per delivery. Order your bag by clicking the green button above and let us know if you want your bag delivered or if you want to come and pick it up. Delivery will incur a small postage charge, but picking them up is completely free. We would love to see how you get on with your offcuts, so get in touch and tell us how your project turned out. The remnants are free, but we charge for delivery to you. If paying for delivery please note we do not profit from this - we charge you what the carrier charges us. We prefer you to have it to use creatively rather than wasted. Please note: We can only ship fabric remnants within the UK. If orders are placed for shipping outside of the UK then your payment will be automatically refunded to you, and the remnants will not be sent. If you do something fantastic or creative with your bag of remnants, we'd love to know about it. Please feel free to share these ideas with us using our social media accounts - if you make something special, or show us an amazing idea there could also be a reward in it for you. We print onto the fabric as step one, before we cut the material to the required pattern. This means that when we do cut the textile down there is waste from the sides. Also when we print fabric sheets, some customers prefer to have their material cut on the line - which means we remove all of the white material from the edges of that piece of fabric. As a result of this, there is a reasonable amount of fabric waste. We made a promise to ourselves to lessen our waste across the board, but we are on a mission to become fabric waste neutral. We don't want to be sending these scraps to landfill, and they are consistent enough in size and shape for us to guarantee that we could do anything specific with them on mass, so we have decided to bag them up, and offer them for free! You could even use your bag of fabric remnants to learn how to print on fabric yourself. Simply use your photos or designs, upload them to our online design tool and we can print them on our fantastic transfer paper so that you can then practice DIY printing at home. We have no minimum order so you can start with as little or as much as you like.